Your privacy is important to us. We value your right to maintain confidentiality and avoid solicitations. Below, we have provided detailed explanations of our privacy policies, how we use your data and personal information, and other legal information about this website. Please continue reading to learn how we handle your information. When site visitors comment, US Tax Help collects (1) the data displayed on the comments form, and (2) the visitor’s browser user string agent and IP address. We use this data to detect spam more efficiently. If your comment is approved, your profile picture will be publicly displayed. Please avoid uploading images with embedded location data, such as EXIF GPS, to this website. You are free to download and extract location data from images that are displayed on this site. You can opt in to saving your information, including your name and email address, using cookies if you post a comment on the website. This conveniently eliminates the need to re-enter your information the next time you post a comment on the site. Cookies are valid for a period of one year. If you log into the site with a user account, we will use temporary cookies, which evaluate whether your current browser is configured to accept cookies. Temporary cookies, which do not store your personal data, are eliminated once you close your browser. We also create cookies to store your login information and save screen display choices for returning users. Login cookies are valid for a period of two days, while screen options cookies are valid for a full year. Selecting the “Remember Me” option will save your login data for a period of two weeks. Login cookies will be removed once you log out of your user account. Another cookie will be saved to your browser if you revise or publish content to the site. This cookie, which only lasts for one day, merely reflects the post ID of the edited content without containing any of your personal information. Content on this website may include various types of embedded content, such as articles, images, or video files. This content functions as though the visitor has been to the other site. Be advised that these sites can collect your data, utilize cookies, embed third-party tracking functions, and monitor your behavior while visiting the embedded content, such as your interactions with the embedded content if you are logged in through a user account. As noted below, we may gather your personal data from various third parties, including ad networks, analytics providers, and/or payment processing services. Additionally, we may process and collect data concerning your usage of our site and services, such as your operating system. We collect usage data using analytics tracking systems. See our section on usage data below for more information. We do not provide any nonpublic personal information regarding our current or former clients to our affiliates, nor do we supply such information to nonaffiliated third parties, except as permitted by law, the Code of Professional Conduct of the Oregon Society of Certified Public Accountants (OSCPA), and Ethics Rulings of the American Institute of Certified Public Accountants (AICPA). As permitted by law, our Code of Professional Conduct, and Ethics Rulings of AICPA, nonpublic personal information concerning you and previous clients may be disclosed to our affiliates, as well as nonaffiliated third parties, as follows: complying with a valid and enforceable summons or subpoena; during the course of a review of our practices under the Oregon or California State Boards of Accountancy’s authorization; initiating a complaint or responding to an inquiry by the Professional Conduct Committee of the OSCPA, the ethics division or trial board of the AICPA, or a duly constituted investigative or disciplinary body of another State CPA Society or Board of Accountancy; a review of a professional practice regarding the potential sale, merger, or purchase of all or part of our practice, provided we engage in appropriate precautions (such as use of written confidentiality agreements) to prevent disclosure by the prospective purchaser of information obtained during the review; engaging in actual or threatened legal proceedings or alternative dispute resolution (ADR), whether initiated against us or by us, provided we supply only the information needed to file, pursue, or defend against the suit and take reasonable measures to ensure that such information does not become part of the public record; supplying information to firm affiliates and nonaffiliated third parties which perform functions or services for us in accordance with a contractual agreement prohibiting the third party or affiliate from utilizing or disclosing the information, other than for the reasons for disclosure of the information, such as utilizing an outside service bureau to process client tax returns, or storing client records with a records-retention service. There is also some additional information you should be aware of regarding general restrictions on the disclosure of nonpublic personal information to affiliates and nonaffiliated parties. Section 7216 of the Internal Revenue Code (IRC) prohibits us, as a tax preparation service provider, from sharing your income tax return information unless we obtain your consent to do so, except with regard to the specific purposes of preparing, helping to prepare, or obtaining and rendering services in connection with preparation of your income tax return. Additionally, because we are an OSCPA member that offers income tax preparation or financial planning, we generally may not disclose your confidential client information to affiliates or nonaffiliated third parties unless we receive your consent to do so. There are, however, exceptions to this general rule, which are discussed in the section on parties to whom we disclose information above. We limit access to your nonpublic personal information, restricting such access only to employees and other parties who require such information in order to provide you with tax preparation and financial planning services. There are various limitations on their right to further use and disclose such information, such as limitations imposed by pertinent laws; our Code of Professional Conduct; where applicable, our employee code of conduct; and, where appropriate, various nondisclosure agreements (NDAs). Additionally, complying with the pertinent laws and regulations protecting your nonpublic personal information, we utilize various procedural, electronic, and physical safeguards. At US Tax Help, we understand your privacy concerns. We provide a secure client portal, which allows for the secure exchange of documents and electronic communications. While many clients feel confident using our secure client portal, which we offer in partnership with Smart Vault, others prefer to learn more information prior to submitting sensitive documentation. Smart Vault, our partner and client portal solution provider, is a stable and reputable entity which has been providing this service to various accountants and tax professionals since 2008. Of course, online technology has undergone fast-paced development in the intervening years. A company with the agility and infrastructure to navigate these shifting financial and technological waters is a company you can depend on to keep your data protected – not only today, but into the future. Regardless of the reason for which it is processed, your personal data will not be retained for any longer than necessary to satisfy the purpose of its collection, or to satisfy accounting purposes or legal purposes. Any comments you leave on the website, along with its metadata, will be stored indefinitely. This enables us to automatically detect and approve additional comments, rather than processing them through a moderation queue. If you are a registered site user, we will also retain the data supplied in your user profile. However, you are free to view, update, or delete your information, except for your chosen username, at any time of your choosing. Be advised that site administrators also have the authority to view and edit your information. If you (1) have commented on the website or (2) have a user account, you may request that we export and provide you with a file containing the personal data that we have stored, including any data you may have personally provided. Additionally, you have the right to request erasure of your personal information. However, this excludes any data we must retain for legal, administrative, or security purposes. You also have various rights under data protection laws. For example, you have the right to access your data, delete your data, correct your data, limit your data, and/or object to our using and processing your data, including the right to data portability. You also have the right to confirm how and where we process your information. Further, you have the right to withdraw at a time of your choosing, to the extent that the legal basis for our processing consent. The site utilizes an automated spam detection feature to review visitor comments. We collect non-public (private) personal data, which is either supplied by you to us, or which we obtain after you authorize us to prepare your income tax returns and/or provide you with financial planning services. Types of personal data that we collect include but are not limited to your name, in addition to your email address, which is utilized for purposes of newsletter subscription, receiving content, survey participation, and/or the purchase of various services. There are several methods by which we gather data. For example, we collect data directly from you when you buy services, complete forms, or use social media platforms or email services to communicate with us. In addition, we collect information from you when you visit and use our site. Your data may be gathered from various third parties, including analytics providers, advertising networks, and/or payment processing services. We store your data in a secure platform. We utilize your data for processing, either as described below or for a reasonably compatible purpose. We may process data regarding your utilization of our services and/or website, potentially including the following information: your browser type, your geographical location, your IP address, your operating system, the pages you view, the paths you follow when navigating to various areas of our website, and the pattern and/or frequency with which you use the website. We collect this data utilizing analytics tracking systems. The data is used for purposes of providing you with pertinent content and advertisements, evaluating use of our site, and ultimately, better understanding our site users. Our legitimate interest serves as legal basis for processing, namely monitoring and identifying ways to improve our services, website, and marketing efforts. We may process your personal information, including but not limited to your name, your email address, your personal preferences, your geographical information, and other data which you supply in order to participate in surveys and/or subscribe to newsletters, free content, and/or email notifications, participate in surveys. We may also process communication data received from you via email, social media, or other ways of communicating and/or posting information. We process this data in order to provide you with relevant content, communicate with you, and deliver content, marketing, and/or email messages to you. The legal basis for this process is consent, or our legitimate interests, namely to support the growth of our business and maintain records which may be necessary to defend, or pursue, various legal actions. We will receive, and store, various pieces of personal information that you supply to us during the process of registering for our service, either via email or our website. Examples of this information may include, but are not limited to, your name, date of birth, gender, home address, phone number, email address, Social Security number (SSN), marital status, profession or occupation, and related or similar items of preference data which you supply us with. While it is your decision whether you wish to provide us with such information, please be advised that, due to the nature of the service we provide, we cannot provide such service with receiving such information. We process data in order to provide you with services, in addition to marketing other pertinent products and services to you. The legal basis for processing is consent, and your affirmative action to enter such contract with us and/or the delivery and purchase of the contract between you and us. We collect information from various sources, including financial history questionnaires, financial planning organizers, interviews with clients, and tax return organizers. We obtain your information in order to properly prepare your personal income tax returns or provide financial planning services. We collect your information using various methods and formats, including via phone, via mail, via written forms, online, or during the interviews and consultations we conduct. In addition, we may collect information from additional sources once we have obtained your authorization. Your transaction information encompasses the information needed to complete billing and payment processing for the financial planning and tax preparation services we provide, as well as any correspondence you engage in with us. Transaction information also extends to your payment history with us, including billing records as well as any collection efforts undertaken by us to obtain payment for the services we provided to you. SSAE 16 Data Center– SSAE 16 data centers are highly secured facilities where your data is guarded around the clock by an array of security measures. For detailed information about your rights, see the section discussing what rights you have over your data above. Additional information about how we protect your data, our data breach procedures, and other topics is provided below. US Tax Help uses an Intermediate Service Provider to access IRS records. The terminology provided by Form 2848 (Power of Attorney and Declaration of Representative) is as follows: “Access my IRS records via an Intermediate Service Provider” (see Section 5a). US Tax Help utilizes third party software to download IRS transcripts. US Tax Help uses software to (1) file your tax returns and (2) access your IRS records. Moreover, the information on this website is intended for general guidance exclusively on matters of interest. Additionally, all information offered during the “Ask a CPA” or “Free Consultation” is solely for the purpose of determining whether US Tax Help can provide tax support for your matter. Only upon mutual agreement to an Engagement Letter, to be entered by both parties, does a professional relationship exist between the taxpayer and US Tax Help. The applications and effects of tax laws can range depending on the circumstances of each case. Due to legislative changes, changes to tax rules and regulations, and potential risks of electronic communication, information contained on this site may be delayed or contain omissions or inaccuracies. Therefore, information on this site is offered with the understanding that publishers and authors are not engaged in providing professional advice or services, including accounting services, tax services, or legal services. The information presented on this site is not intended to substitute a personal consultation with a legal, accounting, or tax professional, nor with other competent advisors. Before proceeding with an action or decision, you should discuss your tax issue with a professional advisor, such as a certified public accountant (CPA). 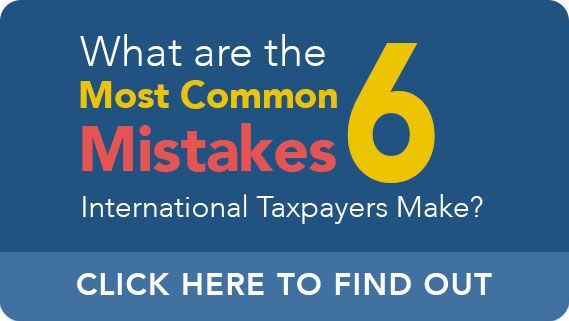 While US Tax Help makes efforts to ensure that the content on this website is based on reputable and trusted sources, Theodore Kleinman, CPA, is not responsible for any inaccuracies or omissions, nor for consequences resulting from use of the information contained on this site. All information is supplied on an “as-is” basis. Likewise, US Tax Help does not guarantee its accuracy, completeness, or timeliness, nor the results from utilization of the information. The information on this site is also provided without any express or implied warranty, including but not limited to warranties of merchantability, performance, and fitness for a certain purpose. Under no circumstances will Theodore Kleinman, CPA, its related corporations or partnerships, or the employees, agents, or partners of such corporations or partnerships, be liable to you or to other parties for any actions or decisions based on the information contained on this site, nor for any special, consequential, or similar damages, even if advised of the potential for such damages. Certain links contained on this site are connected to other websites, which are maintained by third parties that Theodore Kleinman, CPA, does not control. Theodore Kleinman, CPA makes no representations regarding the accuracy, or any other component, of the information supplied on external websites. 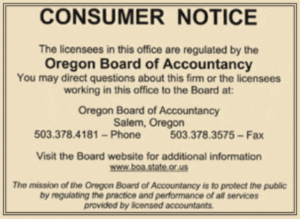 Licensed by the Oregon Board of Accountancy.